With Joey Elliott referring to himself as a gunslinger a week earlier, Travis Lulay and the BC Lions rode into town from the wild west for a showdown. But it was the defence of both teams that did most of the shooting in a 20-17 BC Lions win on a last second Paul McCallum field goal. Here’s how I saw it, from the couch. Something is wrong with the Lions offence, and they’ll need to figure it out this week before heading to Montreal. To me it seems like the offensive line is a little off at the moment. Lowell Ullrich mentioned in his video blog that Angus Reid is possibly banged up (ankle) which could partially explain the lack of production from the running game lately. 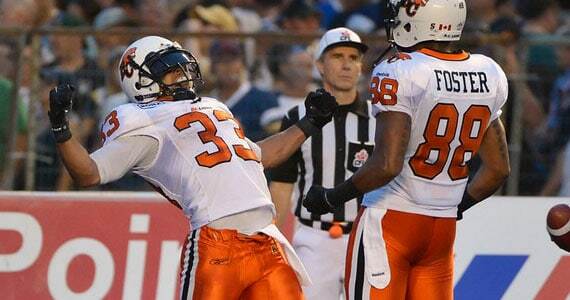 Lulay was pressured often and made some bad decisions; his two interceptions in the fourth were prime examples. Hand-offs to Andrew Harris appeared telegraphed and awkward at times. Lulay came through with a big play downfield to Shawn Gore, with the pocket collapsing around him. It was a clutch play for sure and earlier I suggested it may be time for Lulay to take a seat. While some saw that as a lack of faith, I simply saw it as one of those games and a chance to see if Reilly could spark something. I’m glad I was wrong. Clutch as well was Geroy Simon, who among two Bombers defenders made a key catch on the final drive. The Lions also need to find a way to get Harris going again on the ground. Again, it could be a product of the trench battles, but it seems like the running game is getting stuffed a lot. He came through when it counted however, as he usually does. Finally, the Lions had a tough time dealing with the noise in the stadium. There were procedure calls, and clock management issues that are indications that the team needs to work on this aspect of their offence a little more to clean things up. The Lions defence certainly came to play again and were awesome in the first half. They struggled a bit with some sloppy tackling in to start the second and took some penalties that hurt, though a couple were just plain bad calls. I thought the Bombers offensive line did a pretty good job containing the Lions pass rush and giving Elliott time to throw, especially in the second half. Elliott was able to find pockets in between coverage in the secondary, particularly with Chris Matthews to keep drives going. On the drive that Winnipeg tied the game at 17, I thought the defence played a little too soft before forcing the field goal. Jabar Westerman continues to show why the Lions wanted him so badly in the draft and had another strong performance filling in for the suspended Khalif Mitchell, who returns next week. The no touchdown streak came to an end, but it was going to sometime. Still it was a very impressive outing overall by the defence. It sounds like a broken record but field position was a factor in the game, especially in the second half. The Lions allowed a decent return to start the second half and it took them almost the whole half to get out of their end of the field. The return game wasn’t strong and once again blocking was poor, giving Tim Brown and Marco Iannuzzi and company little hope of getting a big return. There were bad calls that went both ways tonight. I did think the roughing the passer call on Stewart of the Bombers was legit. Lulay had slowed to a slow trot and was clearly headed out of bounds. Stewart just had to ride him out, not take him down and that will get called every time. Other calls were questionable including two roughing the passer penalties for a shove on Joey Elliott by Dante Marsh and Jabar Westerman respectively. Corey Watson was flagged for objectionable conduct for spinning the ball after a catch, a move not unlike what Geroy Simon does routinely. Overall the officiating was pretty strict tonight. The “Gunslinger” had a tough first half and was probably fortunate to not have a few more passes picked after throwing a few into the hands of Lions defenders who couldn’t haul them in. But Elliott never got rattled and had a decent second half. Perhaps the Bombers do have a new Sheriff in town. I can hear some saying now, “We won and all you’re doing is complaining”. Sure the win is all that counts, but there is a lot of work to be done. Credit has to go the Bombers as well who played hard and made the Lions earn the win. The Lions will be facing a good Montreal team next week and will have to be on top of their game to extend their streak to five in a row. Next game I’ll be at McGill to take in the game live. I’m not sure if I’ll have a chance to get a blog in, so if not, I’ll see you in two weeks when the Lions return home to take on the Alouettes in the second leg of a back to back.